[Kindle Ebook Deal of the Day] Grace Ji-Sun Kim – Guide to the Holy Spirit – $3.99! [easyazon_image align=”left” height=”333″ identifier=”0830845445″ locale=”US” src=”http://englewoodreview.org/wp-content/uploads/2019/01/51zPVur24PL.jpg” tag=”douloschristo-20″ width=”222″]Who is the Holy Spirit? In this brief book, author Jonathan K. Dodson invites the reader to discover who the Holy Spirit is and to come to know Him better. “The most meaningful, creative, satisfying life possible is one lived here in Spirit,” writes Dodson in the introduction (5). [easyazon_image align=”left” height=”333″ identifier=”0310534062″ locale=”US” src=”http://englewoodreview.org/wp-content/uploads/2017/07/51rfktNsl3L.jpg” tag=”douloschristo-20″ width=”218″]Who is the Holy Spirit? Recently, while discussing the final paper for her senior Faith and Culture class, my daughter posed a question that I think many Christians have wondered at different points. Mom, what is the role of the Holy Spirit? Often, there is an ease and comfort with which we discuss the role and attributes of the Father and the Son. But when we mention the Holy Spirit, we find ourselves, well, pausing and perhaps struggling to find the right words to describe who he is. As Michael Horton, the author of Rediscovering the Holy Spirit: God’s Perfecting Presence in the Creation, Redemption, and Everyday Life (Zondervan, 2017) aptly acknowledges, “Who exactly is the mysterious third person of the Trinity? Why does he seem to posses less reality or at least fewer descriptive features than the Father and the Son?” (13). Video #1: Do We Forget the Holy Spirit? 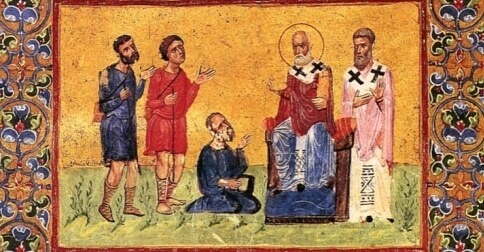 Today is the Feast Day (in the Eastern tradition of the Church) for Gregory of Nazianzus, who died on this date in 390. Gregory of Nazianzus ( c. 329 – 25 January 390), also known as Gregory the Theologian or Gregory Nazianzen, was a 4th-century Archbishop of Constantinople, and theologician. He is widely considered the most accomplished rhetorical stylist of the patristic age. As a classically trained orator and philosopher he infused Hellenism into the early church, establishing the paradigm of Byzantine theologians and church officials. As Gregory’s greatest contribution to theology was likely his work on the Holy Spirit, we are pleased to offer here, his Oration on the Holy Spirit. The Holy Spirit in Orthodox Tradition. I often find myself in the last scenes of John’s Gospel. First I am with Jesus’ followers in the upper room, bewildered by the ordeal of Jesus’s crucifixion, hearts harboring the faintest hopes of a rumored resurrection. Suddenly, though the doors are bolted shut, Jesus stands among us, raising wounded hands to bless us. And though the doors are bolted shut, he sends us out with the same purposes for which his Father sent him. Next, Jesus breathes on us the Spirit, to comfort and encourage, to authorize and to empower. “Receive the Holy Spirit.” The Holy Spirit, the ongoing presence of Immanuel, God with us, our share in Christ’s baptismal anointing, the love of Christ which compels us to unlock our doors and go out as ambassadors of reconciliation. Jesus’ has given us his Spirit. Then I read chapter 21: Peter says, “Let’s go fishing.” Commentaries on this passage tell me that the apostles (for Jesus has indeed sent them) needed time to understand the full significance of their commission. Apparently. Only after Jesus shows up on the beach, after he shares breakfast with his friends, after he pulls Peter aside for a private conversation do we begin to realize with Peter the Spirit’s work: Jesus said to Peter, “Follow me” (John 21:19). The Holy Spirit and the Art of Becoming Human. While working on my novel the other day, I had an unusual experience. My characters were talking along, when one of them said something profound. It wasn’t the profundity of her words that surprised me, but rather the fact that what she said wasn’t something I knew, or at least wasn’t something I could have articulated before she said it. In fact, her words seemed to come from someplace other than myself, somewhere outside of me. Artists and other creative people, as well as those who enjoy their works, have long touted the close relationship between spirituality and creative endeavors. This is especially true among Christians, who like to talk about creativity coming directly from the Holy Spirit, as one of His many gifts. According to these people, what happened with my character wasn’t as unusual as it felt in that moment, but is actually commonplace among those who spend much time practicing art. In Creator Spirit, Steven R. Guthrie attempts to examine these creative experiences, not necessarily to illuminate the creative process, though some of that happens along the way, but to see what we can learn about the Spirit through these experiences.